6120 BLK For you vintage folks! I don’t know why but I have for years lusted after a black 6120 and this thing shows up. 1958 BLACK Gretsch 6120 Chet Atkins Vintage Electric Guitar - Custom Color and Special Features! Special features especially the price" Gretsch have produced limited runs of the 6120 under Fender in black and do look stunning . The seller obviously hasn't been paying attention to the market, where not so long ago a vintage 50s 6120 finished in black, owned by Chet Akins, with unique technical features, and rock solid provenance couldn't fetch that kind of price. Why would they think a standard '58 with no documented celebrity affiliation or uniqueness beyond the finish would? When dealers use the "perhaps made for (fill in famous person's name)" that always seems like a dubious claim. Trying to make a dodgy Bigsby sound "special" by describing it as "hand painted" just makes me chuckle. Just wondering, when people pay that kind of money for a guitar, are they doing so as an investment? Like a rare coin of stamp? Or do they enjoy playing the thing? Could it perhaps be like a painting to hang on the wall and enjoy looking at ? Where does the true value reside? If you posses a rare object what do you value it for? Those that I have/had the enjoyment came from reading the history of why it existed in the first place. Ed I agree with all points here.I should’ve initially said for myself personally I’m not in the vintage market I just think it’s a beautiful guitar but I have always thought 6120’s in black were just great looking guitars ....almost 40k, yeah crazy for sure! 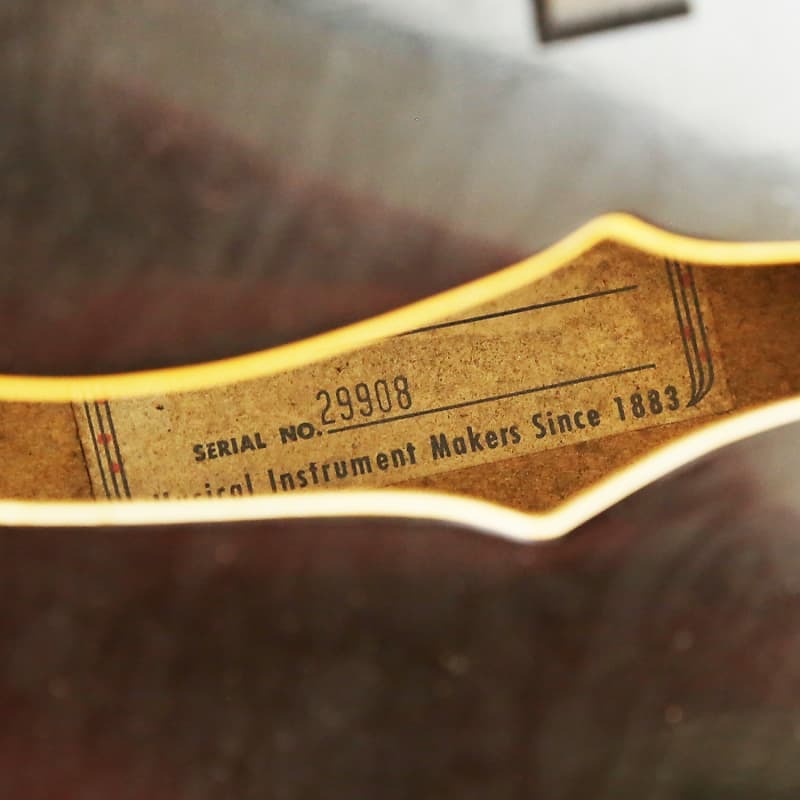 Been a little while since we've read s much BS about a Gretsch's provenance. This claim that it could have been made for Chet is ridiculous for one specific reason and that's Chet hated f-holes and most certainly wouldn't have ordered a guitar with them. He wanted no f-holes on the Gent they designed but accepted having them painted on. The 6120 he ordered with the very thick carved top had the f-holes only as an outline. IMO, this guitar has categorically nothing to do with Chet. As we've discussed here at other times, a 6120 that isn't orange seems to garner a lesser value. I put this one as worth a fraction of the asking price. Agreed! With all due respect to Gretsch orange (Which I also love), there is something about that shape in black that just stands out. I don't have a 6120, yet, but the looks of my black 5120 grabbed me at first sight and when I played it, it was a done deal. It's not the most expensive guitar, but it's one I'm never getting rid of. I'm betting you got her for a better deal than the one above but it doesn't have the hand painted Bigsby. I'll just point out that it's pretty unusual for original Gretsch finish work to have so much checking. Not unheard of, but atypical. Food for thought. Seller was in contact with me last year. Said he was offered 25K for the guitar cash. I replied he should have taken it right away haha. He wanted around 30K. I tried to let him know where this guitar stood in my perceived value (as well as Ed's). We were light years apart in that number. It would damage his self-esteem ever to sell the guitar. As long as he never sells it, he has the satisfaction of owning a 40,000-dollar guitar, worth five times more than anyone else’s. I have a non-functioning push mower from the 90s worth 5,000.00. No one will give what it’s worth, so I’ll just hang onto it, thank you. I had one of those in black and it was fine instrument despite what Gretsch did to it to mount the Gretschbuckers. I made it into a perfect copy of my black 64-65 anniversary. I bet with the right pickups it with would very sonically similar to a 6120. I looked at a bunch more of that seller's listings, and most are perfectly reasonable - some a little low, even; some a little higher than average. But on some items he's just wacky: an Ace guitar strap from the 60s for 200.00? Maybe it goes with this beat-up black 6120. Is the label photo showing some black overspray? Sorry man. Guess you just can’t cut it. Oh darn. The listing has ended. Don't worry, it's back. Different seller (maybe). I think he paid 40k for it this morning and now has it listed for 30k. Sure, he loses a little on each sale - but he makes it up in volume.